You Need Perfect Custom Wedding Favors For Your Special Day! Comments Off on You Need Perfect Custom Wedding Favors For Your Special Day! New Custom Wedding Favor Ideas: It’s wedding season again! Time to think about your wedding favors and accessories that you’re going to need. Your wedding day won’t be complete until you have some custom wedding favors from The Executive Advertising! Our promotional products are not just for marketing your business, they’re for remembering the special moments of something. That happens by customizing something special to handout to your guests, family and friends. With some of our new ideas for personalized wedding handouts, you’ll be able to hold on to that special memory always. 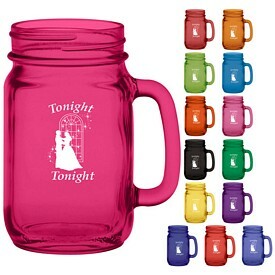 One of the hottest wedding advertising items that are still trending is the imprinted mason jar glasses. These have been around for years and hold a special meaning to drink ware. They have that special looking feature to them that shows tradition to something special. So raise your custom mason jars and say cheers to the new Mr. & Mrs.! Of course there is still the popular advertising koozie, these will always be hot and easy advertising for any event. Perfect free handouts with your special imprint added for free. Customize your koozie to say the perfect wedding slogan! People will always use koozies for their cold canned or bottled beverages. But you say you’re looking for something new and different to handout at your wedding? Here at The Executive Advertising we some fun new advertising promos that would be great at your wedding. 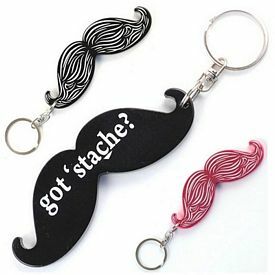 One of my new favorites is the promotional mustache key chain bottle opener comes in hot pink or black for great wedding colors. Imprint your free laser engraving and order these fun wedding gifts for your guests! So if you’re looking for something for a special kind of wedding on a budget, check us out here at The Executive Advertising, many of our newlyweds have absolutely pleased with our advertising wedding promos for their big day. You don’t have the time to worry about how to make your guests feel welcome and happy, we’re here as a sales team to do that for you! If you’re not sure what to use in your wedding just give us a call anytime during the week, and we’ll get started for you and make this the best day of your life! Previous postPromotional Fitness Products: Your New Advertising Health Ideas for 2015!